How to get to disneyland from Mirador mansion? Pls. help me how to get to disneyland and what we are going to take for example MTR...pls. tell me the some of their landmarks. We will be stay in some place at Mirador Mansion. Comments for How to get to disneyland from Mirador mansion? How to get to Disneyland from Ocean Park? We are staying at Mirador Mansion but we are going to Ocean Park early in the morning. From Ocean Park we are planning to go straight to Disneyland. How can we get to disneyland from ocean park? Yes, the route you mention is very doable. we are planning on a DIY Tour in September. Will this be an ok route? From the Airport we will go straight Ngong Ping 360 for half day. The after Ngong Ping we will go to Disneyland. From Tung Chung how can we get to Disneyland Resort? Getting to Hong Kong Disneyland from Mirador Mansion is easy thru MTR trains. 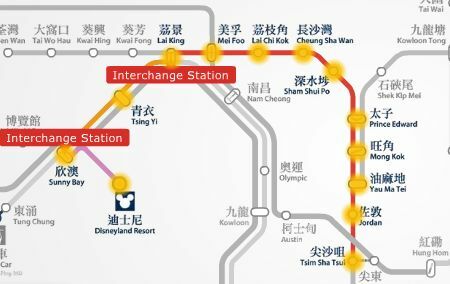 Get into the Tsim Sha Tsui MTR station, thru Exit D --> take the Tsuen Wan Line train and get off at Lai King station --> interchange trains to the Tung Chung Line and get off at Sunny Bay station --> finally, interchange trains to the Disneyland Resort Line straight to Disneyland MTR station. Total train travel time is 38 minutes @ HK$17 half fare for child under 12 and seniors above 65 of age. Please refer to the below MTR route map. Note that if you get into the Tung Chung Line and you'll ride all the way to Tung Chung, taking Exit B is going to the NP 360 cable car and taking Exit C will get you to the Citygate Outlets.